While perusing my medicine closet, examining all my drugs, medicines and various vitamins and supplements, I noticed something on the label of one of the supplements. I'm speaking of my Fish Oil capsules. 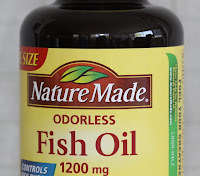 They're 1200 mg of odorless Omega 3 fatty acids, and stuff. But hold on! There’s an additional benefit that really caught my eye. 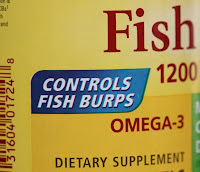 This extra benefit of the fish oil capsules is one you wouldn’t expect from a supplement!! After thinking about all the work it took to accomplish this, I blessed the scientists, and then thought, why the Hell not? If science can control farts, why not burps? Especially in fish, whose burps rival (if not surpass) the aroma of many farts. The only other questions I’d have, is how to get that big capsule into their tiny little mouths, or in the opposite, into a larger fishmouth? You’d probably have to wrap it in a worm or a corndog or something, I guess. Oh man! I want to have my Greatness fueled! I use it so much I am constantly having to switch to my reserve tank of Awesomeness! That's an interesting point you make there, but I don't think fish even like corndogs so you may have to rethink that approach. And isn't fish burps good for the water anyway? A sort of airation if you will?